The United States government is moving forward with a plan to sell $60bn worth of advanced aircraft and other sophisticated weapons systems to Saudi Arabia , in what is believed to be the largest U.S. arms deal ever. The Obama administration sees the sale as part of a broader policy (another continuation of Bush Administration policy) aimed at supporting "Arab allies against Iran", and is expected to notify the U.S. Congress about these plans in the upcoming weeks as required under the Arms Export Control Act. Under such arms deals, generally, the foreign customer enters into a direct relationship with a private U.S. company, which must then apply for an export license from the State Department in accordance with U.S. law. These export license applications must then be approved. The U.S. is the world's largest arms supplier and the Saudi deal alone is said to support up to 75,000 jobs (nice tie-in to declining jobs numbers, everybody should support this now right?? ), according to firms such as Boeing, Northrop Grumman, Lockheed Martin and General Electric. Last year, despite a recession that hit global arms sales, the U.S. increased its share to more than two-thirds of all foreign armaments deals, according to a congressional study. Despite these figures, reporting on U.S. arms transfers is often incomplete, unclear, and hampered by overly aggregated data. This is particularly true of information released to the public. The U.S. armament suppliers have had a very busy year thus far. Earlier in 2010, the United States sharply expanded its weapons sales to India, Pakistan, and Taiwan in an apparent bid to gain influence in both South Asian countries while "creating new opportunities for American defense firms." The Taiwan arms deal proved particularly problematic as it resulted in China suspending military exchanges with the United States, threatening unprecedented sanctions against American defense companies, and warning the two-countries' relationship would further suffer. I read about the U.S. record arms deal to Saudi Arabia early this morning while watching the HBO Documentary, "My Trip to Al Qaeda" (it's called multi-tasking people). 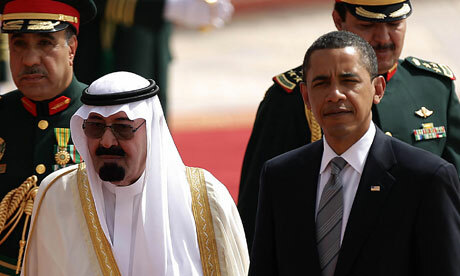 After viewing the documentary, my opinion of the Saudi Arabian government is not a good one. One of the most informative portions of the film deals with the repressive climate in Saudi Arabia, where, Lawrence Wright says, there are "royal highnesses and ordinary highnesses, and everybody else." He calls it a country "over-ripe for revolution," explaining how their government leaves the normal people in a position where they hate their own lives and find pleasure only in shopping. After viewing My Trip to Al Qaeda, I put on another documentary, "Peace, Propaganda and the Promised Land: Media and the Israel-Palestine Conflict." This film provides a striking comparison of U.S. and international media coverage of the crisis in the Middle East, focusing on how structural distortions in U.S. coverage have reinforced false perceptions of the Israeli-Palestinian conflict. The documentary exposes how the foreign policy interests of American political elites (oil, arms manufacturers) and a need to have a secure military base in the region, among others, work in combination with Israeli public relations strategies to exercise a powerful influence over how news from the region is reported. For many years, Israel has been the largest recipient of U.S. foreign aid. Israel is the largest cumulative recipient of U.S. foreign assistance since World War II. From 1976-2004, Israel was the largest annual recipient of U.S. foreign assistance, having been, allegedly, supplanted by Iraq. Since 1985, the United States has provided nearly $3 billion in grants annually to Israel. Almost all U.S. bilateral aid to Israel is in the form of military assistance. Strong congressional support for Israel has resulted in Israel’s receiving benefits not available to other countries. For example, Israel can use some U.S. military assistance both for research and development in the United States and for military purchases from Israeli manufacturers. In addition, all U.S. foreign assistance earmarked for Israel is delivered in the first 30 days of the fiscal year. Most other recipients normally receive aid in installments. Congress also appropriates funds for joint U.S.-Israeli missile defense programs. Before last Christmas, President Obama signed into law one of the country's biggest aid pledges of the year, a deal for $2.77bn to go to Israel in 2010 and a total of $30bn over the next decade. There is a caveat to the funding, Israel is bound to use 75% of the aid to buy military hardware made in the U.S. This year, presumptively to abide by the U.S. funding stipulation, Israel agreed to purchase three new Hercules C-130J airplanes, designed by Lockhead Martin. Each aircraft costs $70 million. Historically, Israel has been extremely edgey when the United States sells weapons to its commonly believed enemies, like Saudi Arabia. With the U.S.-led vilifying of Iran, Israel and Saudi relations are improving as they embrace the fact that they each share a common enemy with Iran. There have even been allegations that Israel has been permitted to set up a base in Saudi Arabia. Nowadays Saudi Arabia also supports the Arab peace initiative, which offers to recognize Israel in exchange for a Palestinian state. 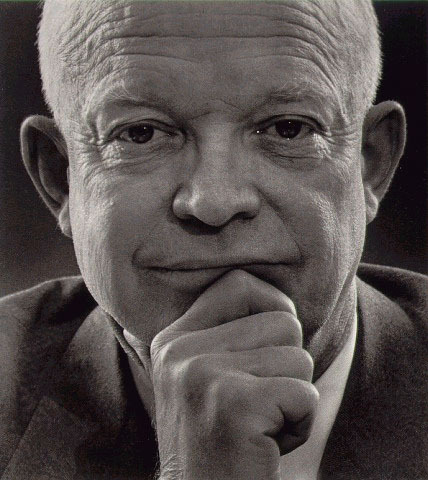 The 34th President, Dwight Eisenhower, in his farewell speech to the nation (cited to in part above), warned of the rise of the military industrial complex, and how "we must guard against the acquisition of unwarranted influence, whether sought or unsought, by the military-industrial complex." In the years since this warning the U.S. government has suffered allegations of favoritism in awarding contracts to long-time industrial partners. To many, these corruption scandals combined with nearly a decade of various conflicts put forth the argument that the nation's politics may justify Eisenhower's warnings. Most of the criticisms of the military industrial complex point to the obvious and logical assumption that economic reliance in military development supports military action. Therefore, if given a choice between diplomacy and military intervention, the country dictated by a military industrial complex would lean away from diplomacy. Continuing on this assumption, it would also make sense that a nation whose economic stability relies mainly on its military would be more inclined to find enemies to engage, in order to spur more growth and development. Following this reasoning, when looking at arms deals, a skeptic, like myself, should question what the supplying party has to gain from the deal. Also, we should ponder who is funding the purchase of the arms and how the purchase money is actually tendered. Lastly, we should ask why the fugg are all of these countries loading up on weapons. Maybe Castro is on to something. Maybe we are entering an era marked my increasing military conflicts. I sure hope that is not the case, but it sure seems that way, doesn't it?